The 2010 Laser Worlds at Hayling Island was a tricky regatta with tide, big shifts and light and strong breezes playing a factor. So it was experience and a relatively consistent score line, with a final race bullet, that got Andrew Murdoch into 3rd place overall. And a fantastic regatta from Josh Junior to finish 6th. The first of the 6 final races on the penutimate day was decisive for some with a knot of tide helping to carry 9 competitors over for a black flag. This brought previous drops back into play and shuffled the leader board. At the close of the regatta we had 4 NZ sialors in the top 16 and 5 in the top 26. At the mid way mark we had 4 in the top 8. The NZL team has to be pleased with such a strong results and all 7 sailors in the Gold fleet. George and Spencer were competing at the Laser Standard Junior Worlds (under 21) which were held at the same time as the senior worlds for the first time. George was 19th and Spencer 12th in the silver fleet. They have both had an epic summer in Great Britain as they competed in the Laser Radial Youth Worlds, Laser Radial Men's Worlds, Sail for Gold at Weymouth and the Laser Standard Junior Worlds. They will be ready for a rest! Wellingtonian, Josh Junior had an awesome day 2 to move into 2nd overall, 1 ahead of Mike Bullot (pictured), leading 4 NZ sailors in the top 12. Andrew Murdoch remains in the top ten holding onto ninth place overall after an 11th and a 2nd on day two, and Andy Maloney takes a giant leap up the board into 12th place sailing solidly last night with a 4th and a 10th. But in these conditions consistency is needed if the current discards come back into play. More reports at http://www.laserworlds2010.co.uk/standard . Mike Bullot mastered a first day of the light to medium breezes, big shifts and tide on the Hayling Island course at the 2011 Open Laser World Champs. His 1st and 2nd places put him just ahead of Paul Goodison (GBR) and Karl-Martin Rammo (EST). Mikes previous career best was sliver at last years worlds in Nova Scotia. Andrew Murdoch had a good consistent day with 6th and 4th to sit 9th overall out of 159 boats in 2 fleets. Andy Malony and Josh Junior are in the early 20s after each having one great race and one not too bad. James Sandall, Max Andrews and Sam Meech each had a good race and one further back to leave them in the middle of the results. But it's early days and the tricky conditions are likely to result in big changes across the board. See the NZ Sailing Team facebook page for more. 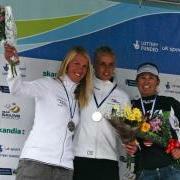 In a tense Radial medal race at the the 2010 Skandia Sail for Gold in Weymouth, Sara Winther claimed bronze and got NZ on the podium. Sara was 2nd overall with 7 points seperating the top 5 going into the double points medal race. No place for the faint hearted. She was 5th at the first top mark but eased through on the tail of the series leader Marit Bouwmeester (NED) in the 6 to 8 knot breeze. However positions continued to change and Sara did well to hold off Sarah Steyaert for a 5th in the medal race and 3rd overall. Brilliant. Bouwmeester (NED) won gold and Sari Multala (FIN) silver. 3 News Video Interview with Sara Winther and Andrew Murdoch. In Weymouth day 2 of the 2010 Skandia Sail for Gold started light with the boats held onshore but ended with races in winds gusting to 25 knots. Josh Junior put in an awesome performance with two wins to jump from 55th to 15th overall. So did Sam Meech with a 3 and 4 to move from 47th to 21st. Andrew Murdoch continues to stand out with a 4 and 7 just slipping to 2nd overall behind Paul Goodison of Great Britain. And Mike Bullot gained some traction with a 3 and 13 to move to 13th overall. In the Radials Sara Winther had a 3 and 4, leaving her 13th overall but well placed to break into the top 10 if she maintains that consistently. While Rachel Basevi with 6 and 8 and Miranda Powrie with 15 and 11 obviously enjoy the stronger breeze compared with the unstable air on the previous day. An exciting first day at the Skandia Sail for Gold regatta in Weymouth with Andrew Murdoch leading across two fleets with a first and second. A remarkable result in the 175 boat fleet given the shifty conditions that left many sailors with 1 good race but not many with two. Josh Junior had a 2nd in the first race, Sam Meech a 5th and Sara Winther a 5th. Yachting NZ has a strong contingent of kiwi sailors at the 2010 Skandia Sail for Gold regatta in Weymouth, England. Sail for Gold is the last of this season ISAF Sailing World Cup. Weymouth is the sailing venue for the 2012 London Olympics. In the womens Radial we have Miranda Powrie and Sara Winther. In the mens standard fleet we have James Sandall, George Lane, Mike Bullot, Andy Maloney, Spencer Loxton, Josh Junior, Sam Meech and Andrew Murdoch. This is a big step up to the major leagues for George and Spencer.